The idea that whistling while you work helps get the job done may have started as a Disney tale, but the combination of music and work may be more beneficial than Snow White could have ever imagined. Although research has suggested listening to music in the workplace improves productivity, office employees are still split on the idea. While some prefer an added melody, others would rather throw on their noise-canceling headphones and get through their day without distractions. So how many people prefer workplace playlists? 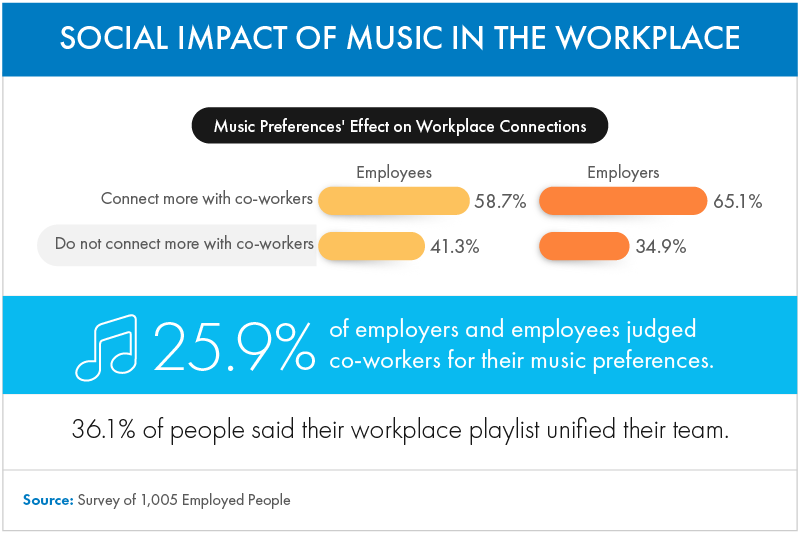 We surveyed 1,005 employees and employers about workplace music’s effect on their productivity, as well as the audio to which they preferred listening. Continue reading to see what we learned about office tunes. According to our study, most people listened to music while they worked, with around 42 percent listening to some form of media the entire workday. Some offices stick with silence as a way of trying to benefit their employees – ridding of distractions and any possible annoyances – but almost 18 percent of workplaces played music. For offices that didn’t provide the playlist, roughly 82 percent of employed people said they were allowed to listen to their own audio if they wanted. Research has shown listening to music is linked to increased productivity at work, but when it comes to podcasts and audiobooks, the research is lacking. However, 94 percent of employed people chose to listen to music at work, while about 35 percent listened to podcasts and 15 percent listened to audiobooks. It probably comes down to the work one is doing when determining whether media benefits or hinders their work. 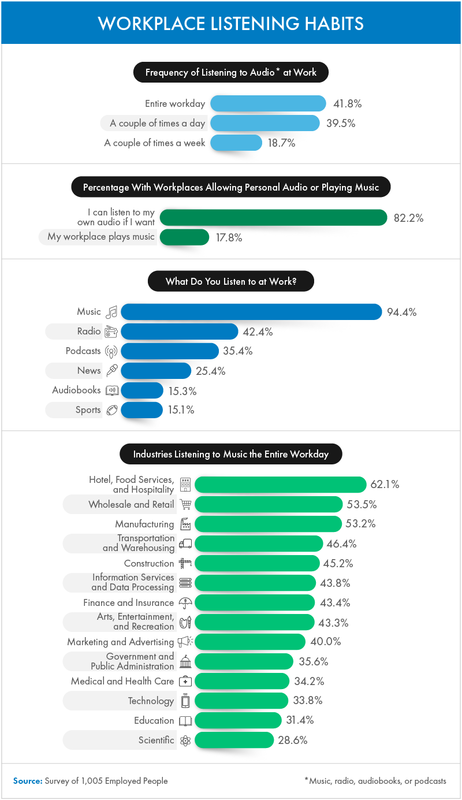 Certain industries were also more likely to have music incorporated in their workday. Seeing as hotel lobbies and retail stores usually have music playing for their guests and customers, it makes sense that the hospitality and retail industries were the most likely to listen to music throughout the workday. On the other hand, those in the education and scientific fields were the least likely to listen to music. Whether music improved their mood, kept them from becoming too stressed, or helped them stay awake, almost 80 percent of employed people believed listening to music at work increased their productivity. Despite research backing the majority’s perception, though, around 4 percent still said music decreased their productivity. However, this may have something to do with listening to the wrong music for specific tasks. The information services and data processing industry was the most likely to think music increased workplace productivity, followed by the wholesale and retail industry. 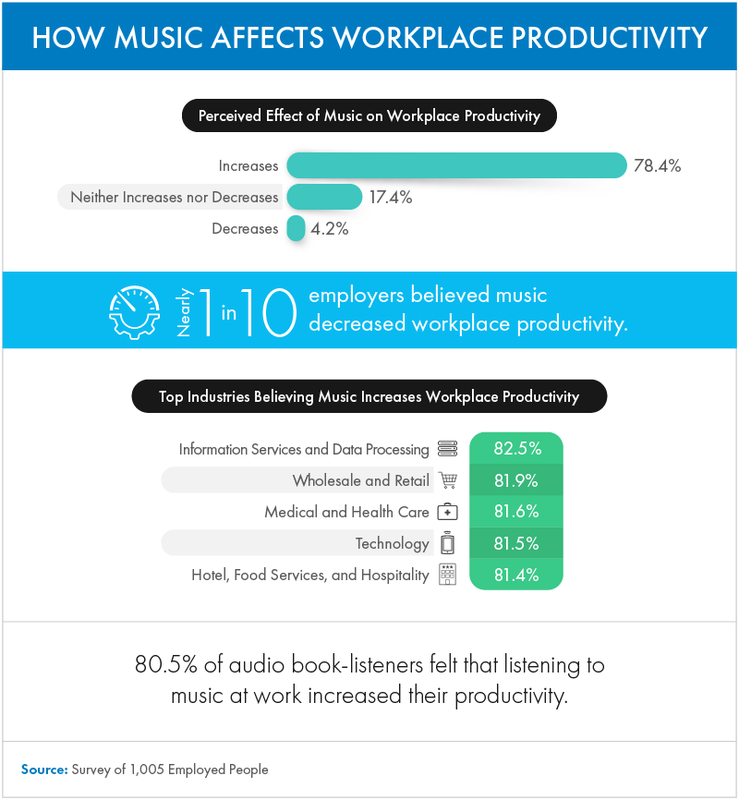 The medical and health care industry came in third for those believing music increased workplace productivity. While it may be weird to think about nurses and doctors treating patients while humming tunes, music has actually been shown to help surgeons focus in the operating room. How Productive Is Your Preference? Listening to music at work isn’t always beneficial. If you’re trying to increase productivity by adding music into your workday, choosing the right genre is key. 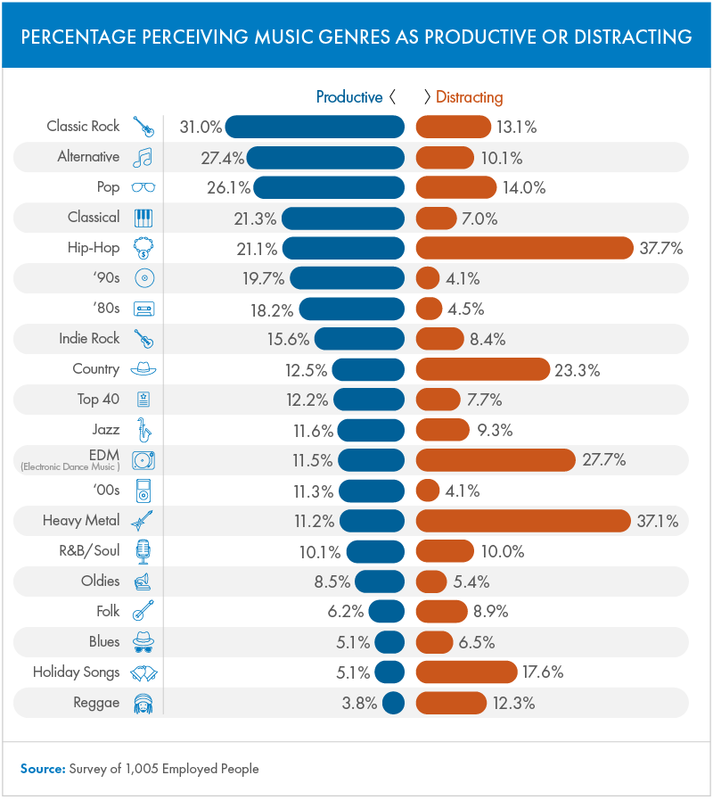 Thirty-one percent of employed people perceived classic rock to be the most productivity-inducing genre of music. Alternative and pop music rounded out the top three genres, followed by classical music – the genre that science says is best for your brain and body. Some music can negatively impact productivity, however. According to employed people surveyed, hip-hop and heavy metal were the most distracting. While heavy metal may not be the best fit for staff needing to concentrate, it could be the genre for you if you’re looking for a playlist to release some anger or brighten your mood. Everyone in the office may not always agree: Music or no music? Rather than just sitting in silence, some employees may turn to headphones to either personalize their playlist or block outside noise. Almost 56 percent of employed people used headphones regularly in the workplace. Interestingly, though, 46 percent put on a pair to avoid conversations at work, which could potentially cause issues in the workplace. Over 67 percent of government and public administration employees used headphones to avoid workplace conversations. Transportation and warehousing employees reported wearing headphones to avoid conversations almost as much as government employees, though. Industry differences aside, the majority of employed people thought headphone use increased their productivity. When walking into a retail store, you’re likely to notice music playing in the background – at times, a little too loudly. Luckily for customers, they are only subject to the music as long as they are in the store. But what about retail workers? The music can get tiresome. For over 62 percent of employees working in retail, they disliked corporate playlists the most when they repeated over and over again. Around a third of employees disliked that other people dominated the playlist, or didn’t like the music being played. Corporate playlists aren’t all bad, though. Seventy-five percent of retail workers thought music increased their productivity, and only around 3 percent thought it had the opposite effect. 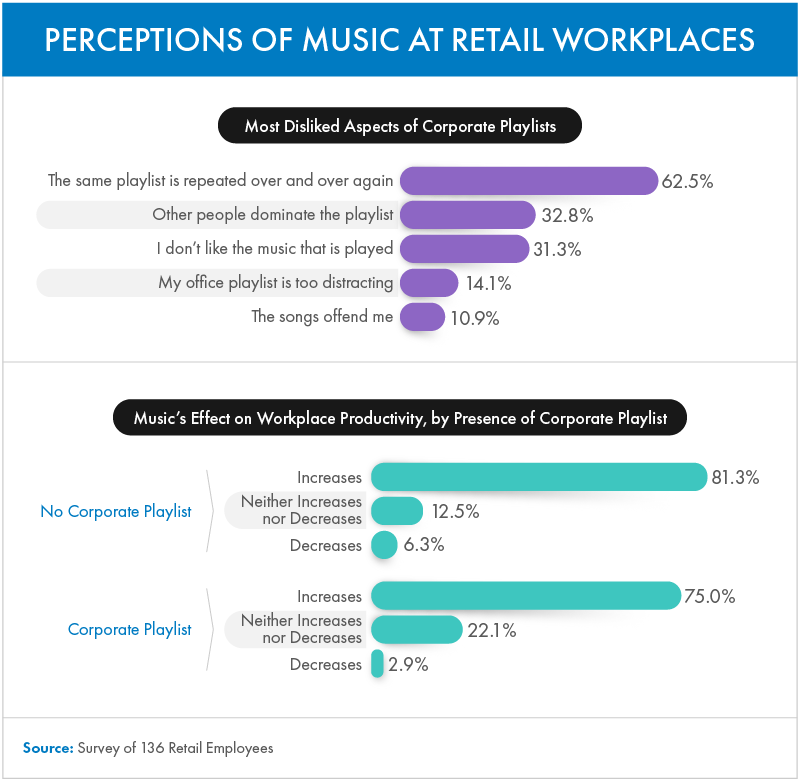 Retail employees without a corporate playlist were even more likely to think music had a positive effect on their workday – 81 percent felt it increased their productivity. They say music is a universal language, and it certainly has a way of connecting people, but depending on whom you surround yourself with, it can also cause a bit of debate. Tastes in music won’t always align, so how do employed people navigate differences in music preferences? Almost 59 percent of employees connected more easily with co-workers or superiors who shared their tastes in music, and employers agreed – 65 percent connected more easily when tastes were shared. However, around 41 percent of employees and 35 percent of employers said music tastes didn’t affect their connections with other staff. A difference in taste may cause judgment, though. Around 26 percent judged others for their music preferences. Still, over a third believed their team was unified by their workplace playlist. There’s no question that music is powerful. It can alter moods, bring people together, and even boost our health. But the music that makes you feel good at home or gets your blood pumping in the gym likely isn’t the same music you should be listening to at work. Picking the right playlist is vital to reap the benefits of increased productivity, and working with the right music provider makes picking easy. At Cloud Cover Music, we provide a wide variety of music types and customized playlists so that your business needs are met. And no need to worry about exposing your business to any serious fines – all of our music is 100 percent licensed so that you can increase productivity without breaking any laws. We collected 1,005 responses from 43 employers and 962 employees in a survey about music in the workplace. 136 of the responding employees currently work in retail stores, they gave an insight into the perception of music at retail workplaces. 49.5 percent of respondents were women, and 50.5 percent identified as men. Participants ranged from teenagers with the age of 18 to respondents with the age of 74. The average age of respondents was 35 and the standard deviation was 10.6. Some industries are not represented due to insufficient sample sizes. The data we are presenting rely on self-reporting by the respondents. Issues with self-reporting can include but are not limited to: selective memory, telescoping, attribution, and exaggeration. Do you find this information on music in the workplace interesting and want to share it with others? You can! Images and information found on this site are available for noncommercial reuse. Just make sure you link back to this page.